Take a tour of Pondicherry, which has a French legacy maintained by the city. A seaside promenade runs along the Bay of Bengal and passes several statues, including a 4m-high Gandhi Memorial. Pondicherry is famous for beaches along with the stunning views it offers and of course, where there is Beach there will be Water Sports. To experience Canoeing and Kayaking for both beginners and the experts, visit Karaikal Beach, it offers you a pleasant and calm place to spend your day. Pondicherry is an adventure place through the history of French colonization. Even simple architectures in Pondicherry will make you wonder if you’re in France, which is how the French influence is. Availability of delicious foods like Tamil authentic dishes idly, dosa to steak and wine of French food is widely popular among the tourists. The distance of 155 km from Chennai through the East Coast Road, you will reach Pondicherry. The driver will pickup the guests from the hotel at the selected time slots. We will visit Sri Aurobindo Ashram, which is among the most visited places in Tamilnadu. The guests are dropped back to the starting point. Pickup and drop-off in Pondicherry city limits. 8 hours and 80 kilometres of usage (can be extended with extra charges). The tour has a limit of 8 hours and 80 kilometers. After 8 hour and 80 kilometers, additional per kilometer charge will be applicable (to be paid directly to the driver). For Sedan (4-seater) - Rs. 11 per km and Rs. 150 per hour (additional kilometer & hourly charge). For SUV (6-seater) - Rs. 15 per km and Rs. 200 per hour (an additional kilometer and hourly charge). 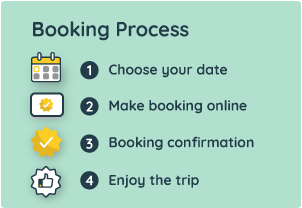 The driver will know the local language, English speaking driver can be requested by you during the booking in "Special Request" section, the team will try their best to fulfill the request but the same cannot be promised for sure.